The Miiverse, or Nintendo’s attempt at a social network around its games, has since its inception been only for people who owned a Wii U. 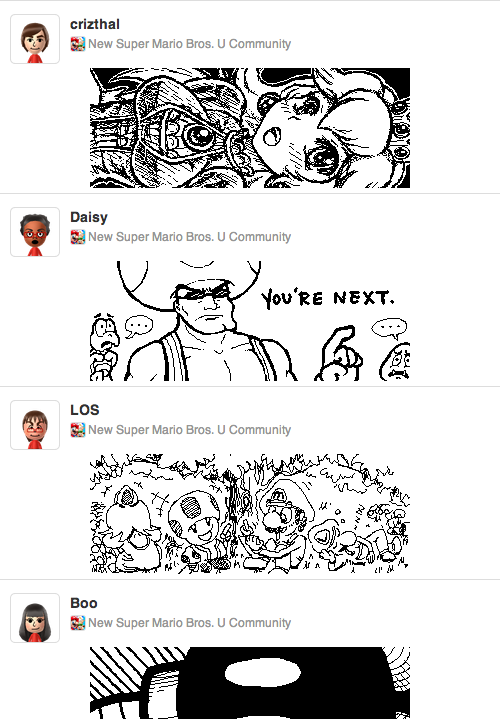 Those smug people, lording their Miiverse pictures all to themselves, thinking they are better than the rest of us…well that’s all changed because you can now view (some of) these same posts and images online. Don’t get your hopes up too much, however, if you are an outsider looking in. The site doesn’t display everything. It only shows some of the more popular posts to Miiverse in an attempt to whet your appetite and force you into purchasing a Wii U. When you log in to the service in your browser…something…happens. I don’t have a Wii U or an account that will let me access the features, so let’s just assume that once you log in all of your dreams come true. Sure, that’s probably it. In any case, it’s a step forward. We now know that Nintendo has an active understanding of the Internet in some form. That can only be a positive thing.